lineTex The AA texture used for rendering. width The width of the line. points List of points to build the line from. Draw anti-aliased line specified with point array and width. Note: Use HandleUtility.GetHandleSize where you might want to have constant screen-sized handles. Note: To get an anti-aliased effect use a texture that is 1x2 pixels with one transparent white pixel and one opaque white pixel. 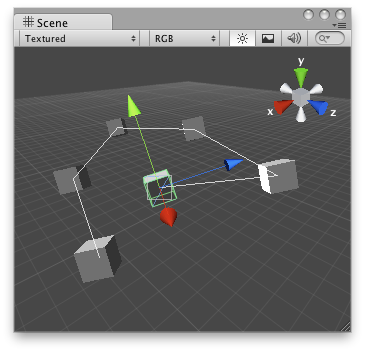 Anti-Aliased line in the Scene View.